Attention All “Coincidence Theorists” ~Mass Immigration Comes to the U.S. It’s not just Europe Folks! The Powers that Be have disclosed their new strategy to further cause chaos, confusion and disorder in a now classic Modus Operandi of Problem, Reaction, Solution. Flood the borders, all borders of Europe and the West with open borders, lax immigration, fast tracked citizenship (sold in U.S. as a Democratic Election play) to create added chaos so the New World Order (order out of chaos) can continue to rapidly unfold. You’ve heard of the flooding of the borders the last two weeks, with not just refugees into Europe, at the gracious behest of a most accommodating NWO shill, Merkel of Germany, but man other countries, now allowing free and unfettered access to Europe. This are not ragged, worn torn, immigrants, but many young an youthful, health and fairly well dressed. ISIS gets blamed for “infiltration” of mass immigrants seeking safer lands, police security, military prescence, etc. get’s called for to “stem the infiltrated terrorists”, Muslim/Christian, Israel vs. Everyone Else war erupts internally in many nations, and Order out of Chaos is brought to us all by the NWO. EZ PZ. the Sheeple will never know what hit ’em. Problem, Reaction, Solution (See Patriot Act-9/11). Well, it’s not just happening in Europe, but in the U.S. as well. Three days previous, out of nowhere, the Governor of California, Jerry “Jesuit Priest” Brown, declares out the blue that California may now begin to see mass migration northward by Central Americans, due to…wait for it….wait for it….wait for it…..okay you ready….???? Gov. Jerry Brown said Monday that his legislative setbacks on climate change last week should be viewed “not in terms of me,” warning California will endure European-style effects of mass migration if the state fails to act on global warming. “What we’ve in Europe now with mass migrations, that will happen in California, as … Central America and Mexico, as they warm, people are going to get on the move,” Brown told reporters at a Mather news conference on California’s wildfires. ….but now, Gov. Brown is addressing mass migration INTO CA…hmmm. Also, please note this is going on exactly when the Jade-Helm mass military exercises have supposedly concluded on September 15 without so much as ripple of tanks in the streets, false real crisis actor military ops in cities occurring in the 5 states the drills were supposed to be conducted, etc….mostly no news of Jade-Helm activities reported by the Alt-news internet. double hmmmm. It’s a multifaceted effort that could potentially add millions of new people to the voter rolls before the 2016 presidential election. The outreach includes online citizenship practice tests, the ability to pay fees with a credit card, and public service announcements on Univision. President Obama announced the new initiative in a video Thursday. Of the 8.8 million legal immigrants eligible to become citizens, about 5.4 million are Latino (and, overwhelmingly, they’re from Mexico). The White House citizenship effort is part of the president’s Task Force on New Americans, which was created through his 2014 executive actions on immigration. But this particular outreach comes at a time when immigration has also again become a heated campaign topic in the GOP primary. “Because the debate over immigration has gotten so polarized, and partisan … there’s a widening, deepening sense that immigrants should naturalize and should use the power of the vote to steer policy,” Pastor said. This is not Obama’s only actions to porously open up all borders in the U.S. The ranking Republican on the Senate Judiciary Committee took the Obama administration to task Friday for its “irresponsible” plan to allow as many as 100,000 Haitians to immigrate to the U.S. without a visa. John Kerry Announces Open Border Policy for United States Immediate Integration w/o Visa or Passport. At the Hungarian-Austrian border (CNN) U.S. Secretary of State John Kerry announced at a news conference in Berlin on Sunday that the U.S. will increase the total number of refugees it will admit each year, to 85,000 next fiscal year and 100,000 the year after. Meanwhile, the main border crossing station between Hungary and Serbia reopened on Sunday, Hungarian government officials confirmed. The closure of the Roszke border crossing caused thousands of asylum seekers over the past week to try to travel through Croatia instead. Then the question has to be asked, are these really the private armies of para-military of hired mercenaries that have been hardened into loyal fighters for hire, trained and battle hardened by Blackwater/Academia/Xe training sites in Afghanistan, Iraq, Syria, etc. 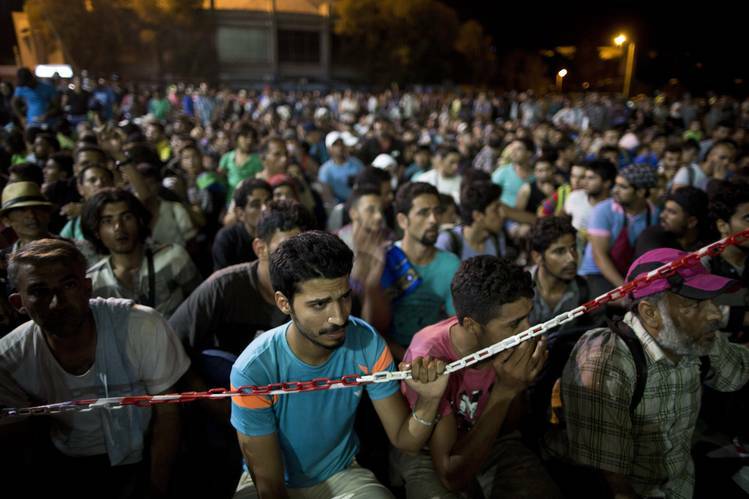 now flooding into Western Europe and the U.S. for the Big Takeover? This migration and herding all to a given area(s) will be for the kill-off of millions by supposed natural cause leaving the CESTUI QUE VIE accounts to the PTB.